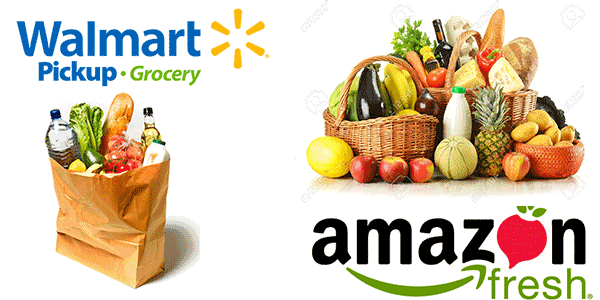 Amazon vs. Walmart - Go grocery shopping! Amazon just bought whole foods and the war between Walmart and Amazon will start to heat up. But there are 3 ways to grocery shop and Amazon and 3 ways to shop at Walmart, both have what you love.... Coupons! Amazon has 3 ways to shop and save! Simply grocery shop! Amazon has a great feature where you clip coupons and order food. Simple as that, clip on order, just like a real grocery store. If you have a prime membership, the Prime pantry opens up and you save substantially more over non prime members. Subscribe and save! For items you but frequently and repetitively, Amazon give you a discount of about 15% over their already low prices if you commit to buying on a schedule. They recommend getting an item every two weeks or so. Amazon will automatically ship and bill you at whatever interval you specify. Amazon Fresh! Limited to a handful of areas, you can order online and have items delivered right to your door many times, in the same day. You must be a Prime member and the service costs $14.99 a month. Print coupons and use in-store. Walmarts have loads available through coupons.com simply select, print and shop. Free 2 day shipping on all orders over $35. This is the same shipping deal most people sign up for Amazon Prime to use. Walmart has if free, provided your order total is over $35. Walmart grocery shopping. It is simply grocery shopping online. Shop for groceries and pick up in store all ready to go. They will even load your car when you get there! Similar to Amazon Fresh service but its free. However, there is no delivery service. Winner: Walmart! While Amazon is probably going to improve, the grocery prices on each are pretty close or the same. But in order to really take advantage of the benefits, you have to pay for Prime, then possibly upgrade to their Fresh! service. With all those memberships, especially the $15 monthly Fresh! Fee, it can add up. No same day delivery on perishable items hurts Walmart a bit, but the savings wins out.